Photographic Story Big Cypress National Preserve, Florida – I had an urge to photograph, but the weather wasn’t cooperating. It was either sunny and windy, or overcast and windy. I decided I needed to go, and so we went in search of something to photograph. 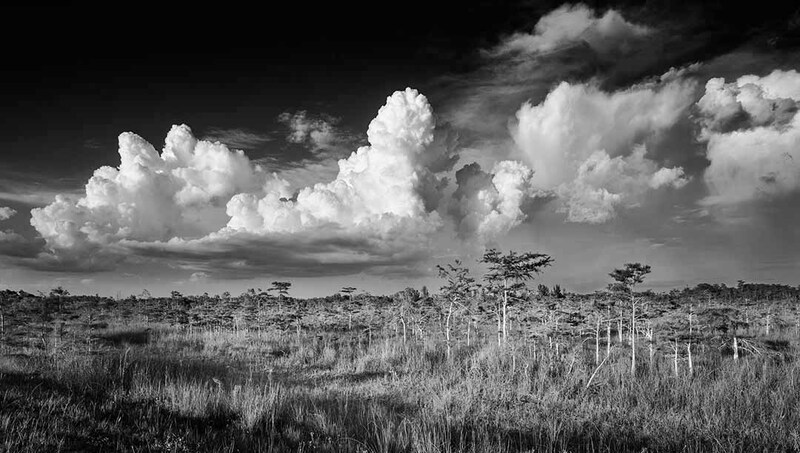 As we drove along Tamiami Trail we could see beautiful clouds forming in the east, so we headed in that direction. When we came to Airport Road, we headed down it and found some wonderful dwarf cypress trees with rolling clouds behind them. Just what I was looking for! Niki and I spent the afternoon photographing as the clouds rolled across South Florida. Digital – Archival Pigment Print This photograph was taken with a high-quality digital camera. The photograph is printed on an Epson Stylus 4800 or 11880 printer. Clyde uses archival Ultra-chrome K3 ink and prints on archival Harman Hahnemuhle paper. The limited edition photograph is then mounted and matted to current archival standards. This is a limited edition series and each photograph is numbered.